To begin with there’s the BBC political journalist who gets the more political air-time than any other – Andrew Neil: he presents or co-presents five hours of television programmes a week including This Week, the Daily Politics and Sunday Politics. Neil is a penetrating interviewer, who exposes weaknesses in the arguments advanced by politicians of the left, right and centre. He’s also a former Murdoch editor, was a researcher for the Conservative Party and is chairman of the Conservative-supporting Spectator magazine. He stoutly argued his free market views at the Hayek lecture at the right-wing Institute of Economic Affairs in November 2005. 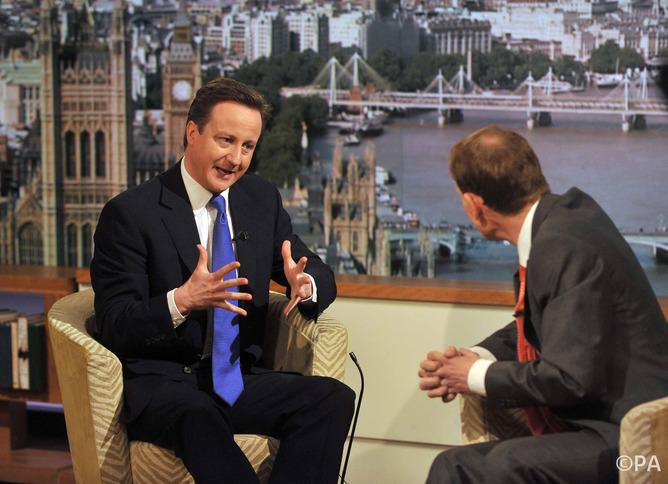 Not one of us at all: Andrew Marr interviews David Cameron before the 2010 election.